Located on a 150-acre family-run farm the surrounding land is home to horses sheep ducks and geese offering a great taste of laid-back rural life. Some fabulous walks and cycle rides can be discovered in the local area passing pretty villages including Cerne Abbas with its famous hillside chalk figure. The owners also have a private pond in a lovely secluded spot which can be fished all year round ideal for fishing enthusiasts. The property is almost equidistant from the historic market towns of Dorchester and Blandford Forum offering boutique shopping facilities with independent shops and galleries. Other attractions and places of interest accessible from here include The World Heritage Jurassic Coastline namely Lulworth Cove and Lyme Regis Milton Abbas and it s famous abbey Monkey World The Tank Museum Corfe Castle Abbotsbury Swannery the abbey town of Sherborne. Inside the breathtaking accommodation is open-plan yet separated into cosy areas through exposed beams and pillars. In the modern and sleek kitchen area you will find an electric oven and hob microwave fridge/freezer dishwasher and washing machine. Once prepared enjoy meals at the dining table beyond which is a light and airy area featuring full-length windows. Two steps down from this area take you to one of the two welcoming lounges where you will find comfortable sofas a wood burner and glass doors opening onto the decked balcony. Also on this floor are the two beautifully presented bedrooms each displaying exposed beams and brickwork and carefully chosen antique furniture. The Master bedroom features a super-king-size zip-and-link bed which can be made into twins on request as well as a day bed and pull-out single bed for children. This spacious and beautifully presented bedroom also has an en-suite bathroom which is approached by three steps and boasts a roll-top bath exposed stonework and feature stone sink. The second bedroom has floor to ceiling windows and features a king-size zip-and-link bed which can be made up as a twin on request. Completing the ground floor is a separate wet room with a shower and WC. When it s time to snuggle up in front of a film head up to the first floor where there is a second lounge with a TV and Sky TV (basic entertainment package) DVD and comfy sofas including a sofa bed. 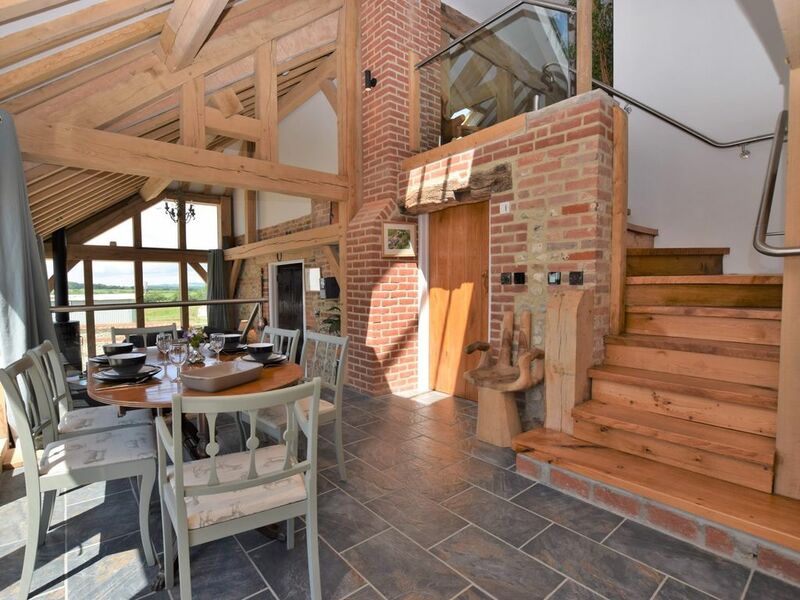 This is a cosy and warm space with lots of character featuring slanted ceilings exposed beams wooden pillars and large Velux windows from which you can enjoy far reaching countryside views. Heading outside is a split-level decked balcony which stretches across the front of the property. Looking out to the farmyard this sunny spot is perfect for enjoying summer meals sat around the large garden table. Also outside the property is ample off road parking in the yard.